Timber Rattler Raindance Bowie / Fixed Blade Hunting Knife - 420 Stainless Steel - Genuine Bone and Pakkwood Handle with Carved Accents - Leather Sheath - Collecting, Field Use, Display and More - 12" | BUDK.com - Knives & Swords At The Lowest Prices! 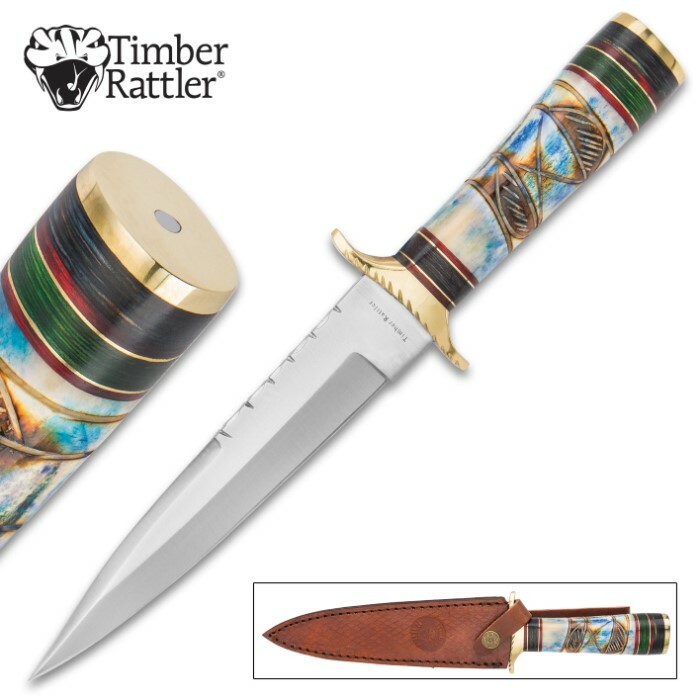 Timber Rattler Raindance Bowie / Fixed Blade Hunting Knife - 420 Stainless Steel - Genuine Bone and Pakkwood Handle with Carved Accents - Leather Sheath - Collecting, Field Use, Display and More - 12"
Teeming with both beauty and brawn, Timber Rattler’s “Raindance” Bowie is a dream for collectors and outdoorsmen alike. 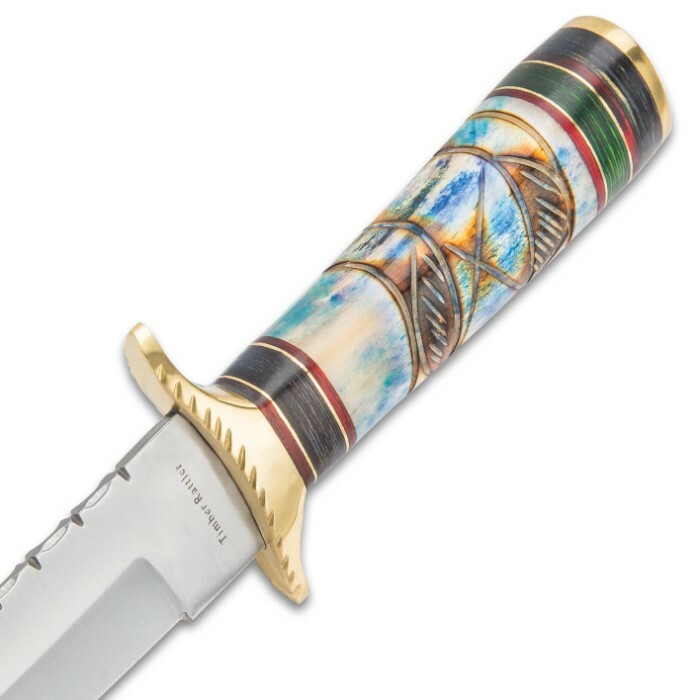 It features a resilient 420 stainless steel spear point blade, accented with distinctive scalloping along the spine. Rock solid and razor sharp, it's great for myriad tasks, from fine, precision cutting to rigorous hacking and chopping, and everything in between. Regardless of the job, the Raindance will look great doing it, with its exquisitely carved handle, painstakingly crafted from rugged pakkawood and genuine bone. Azure vibrant blue stain highlights the delicate grain in the wood and bone for a vivid treat for the eyes! The handle is not only eye-catching and beautiful, it offers a "beautiful" grip and hand-feel, as well! Tough as nails and loaded with cutting clout and visual allure, the Timber Rattler Raindance is the total package. Rest assured: whether displayed in a collection or tested in the field, the Raindance always performs at the top of its game. Well I now own the most beautiful bowie around. Everything about it is unique and high quality. This is a weighty knife. 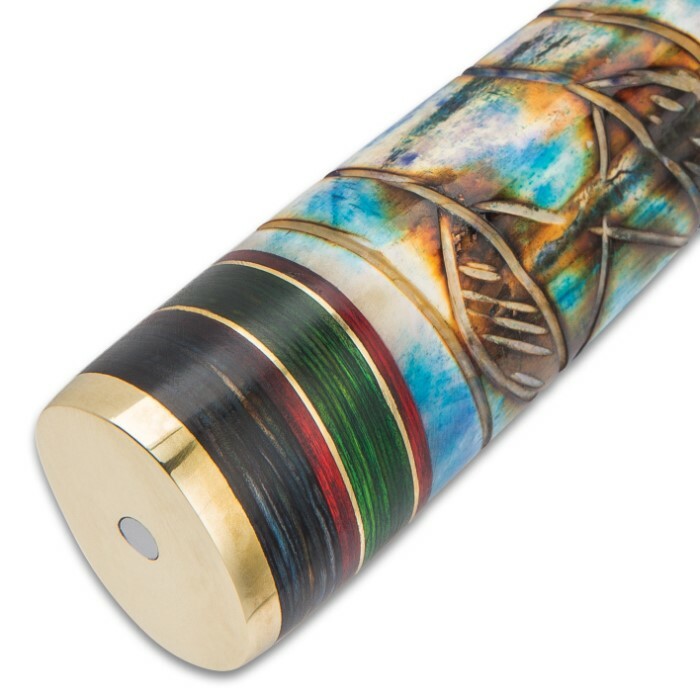 The beautiful bone handle has a splash of blue color, very subtle, and the native ingravings are very individual. 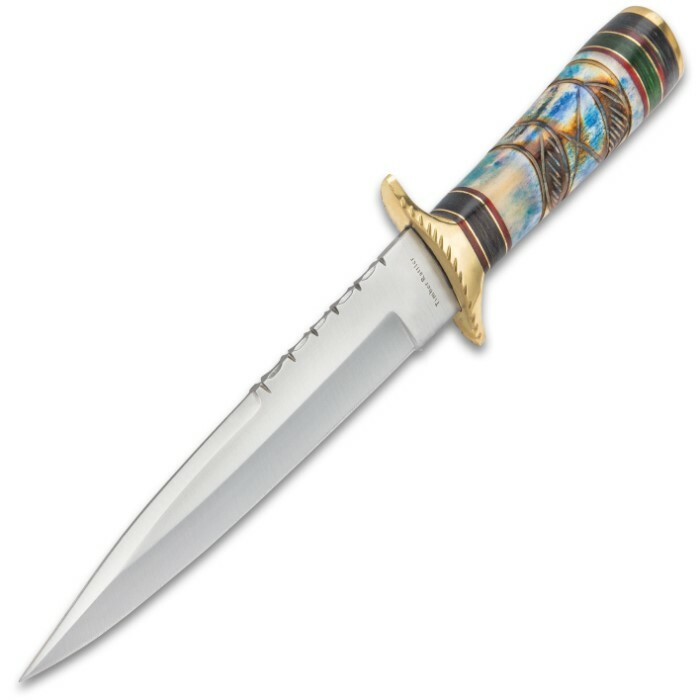 Friends have suggested the design is an hour glass- which could have many meanings...the red, green, and black paka-rings are separated by golden brass bands..and a solid brass pommel, full Tang handle, comfortable and nicely balanced...Let's talk about this blade...a spear- clip modify that blows my mind...a bowie with a spear tip?...look very closely...there is the most subtle clip...but you see a balanced spear blade, beautiful scallops for more individual touches, and a nice spear shaped sheath...nice thick brass hand gaurds on both blade sides, give it a dagger look...needless to say, 6 stars...as the pictures don't give it half justice...if ur an Indian at heart, tie this one to ur hip, and enjoy talking to the gals that will appreciate its gorgosity!! I just got this knife! It's REALLY nice AND its got a LEATHER sheath, NOT nylon as described. Beautiful style with sharp dagger point. Feels really good. I buy a lot of knives from Bud's and this is a new style by Timber Rattler. The sheath is very good and fits tight. The blade is sharp and styled REALLY well. I had made a comment that it advertises a nylon sheath on Buds AND Amazon. I said I would have to BUY it to find out. Its GREAT and the handle is beautiful. BUY IT!